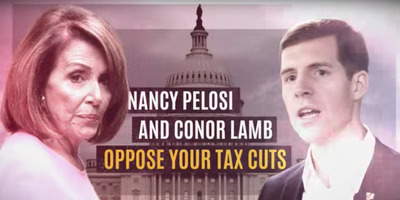 Screenshot/YouTubeNancy Pelosi and Conor Lamb. Republicans are blasting Democratic candidate Conor Lamb over the air in Pennsylvania’s 18th Congressional District’s special election. People in Pittsburgh are overwhelmed by the onslaught of political advertising. More than $US12 million has been spent on the race by Republicans and Democrats. PITTSBURGH – Ask anyone in Pennsylvania’s 18th Congressional District what they think of the huge special election taking place next week, and they will all mention the same thing – the onslaught of political ads. You can’t watch more than 10 minutes of local TV within the district without seeing the latest spot blasting Democratic candidate and former assistant US Attorney Conor Lamb, an ad defending the congressional hopeful, or a commercial taking aim at his Republican opponent, Pennsylvania state Rep. Rick Saccone. “Both campaigns have ran too many TV ads, mostly negative and lacking substantive information,” Justin DePlato, a political science professor at Robert Morris University and a delegate to the 2016 Republican National Convention representing the 18th district, told Business Insider, adding that “less attentive voters are irritated with the bombardment of TV” ads. The seemingly non-stop stream of ads is a result of Republicans – and a well-funded Lamb campaign to some extent – pouring money into the district, which went for President Donald Trump by 20 points in 2016 but is now home to a neck-and-neck race. The Wall Street Journal reported Sunday that Republicans have spent more than $US9 million on the race, which is taking place in a district that, as a result of redistricting in the state, will no longer exist in the fall. The National Republican Congressional Committee has spent more than $US3.5 million, while the Congressional Leadership Fund has spent more than $US3.1 million. The Lamb campaign has spent more than $US3 million. Republicans have sought to tie Lamb to House Minority Leader Nancy Pelosi, criticised his record as assistant US attorney, and claimed that his election will be great for immigrants who are in the country illegally. When is the Lamb/Saccone election? I need the attack commercials talking about Lamb defending drug kingpins and sexual harassers off of programming Ethan watches. Those Saccone commercials are airing continuously during shows like Judge Judy. The good news is that right after there is a Lamb commercial. Living here I wish I was more positive but still a lot of Trump support. And I kid you not.. after I tweeted 4 commercials of rick saccone attacking his opponent Connor lamb just played back to back to back to back… disgusting.. The GOP funded commercials on TV for Saccone in SW PA are disgusting and horrible. The GOP knows how to make elections horrible and unwatchable. EVERY Dem MUST vote to elect Conner Lamb. These hit piece commercials on Lamb are awful and fake. I’ve never voted for a democrat but these saccone ads are sickening. Is there any way to limit the Rick Saccone/Conor Lamb commercials to only those households in the 18th district? The political ads against #Lamb are downright ugly & hateful with misrepresentations & outright lies. #Saccone team must be worried considering the production level . Pay attention to who is paying for these commercials & check them out. Back in Pittsburgh & watching TV for 30 minutes, have already seen 8 Lamb v Saccone commercials for the PA-18 special a month out.